From the tip of Italy's boot heel region comes Essenza, a three-piece whose latest album Devil's Breath marks a significant shift in style for the band. 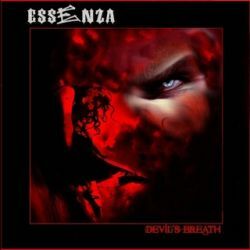 Comprised of brothers Carlo G. and Alessandro S. Rizzello (guitar/vocals and bass, respectively) and drummer Paolo Colazzo, Essenza emerged in 1993 as a melodic rock outfit. After two demos, a full-length and a live recording, the band chose to add weight to their sound and adopt English lyrics. 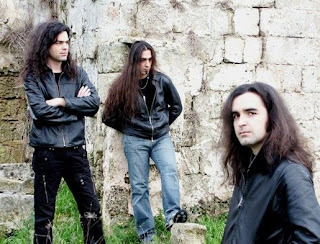 The result is Devil's Breath, a brief eight-song album that finds the band blending traditional metal sensibilities with a touch of modern thrash. For a trio, Essenza delivers a rather robust sound through intricate riffs and copious amounts of multi-tracking. The old-school production, whether intentionally raw or not, adds retro charm without overly muffling the instruments or interfering with Carlo's distinctive vocals. The complex yet melodic riffs, particularly those of the title track and "Edge of Collapsed World", are rooted in the classic metal style pioneered by bands like Judas Priest and Iron Maiden. In fact, the swirling lead that closes out "Deep Into Your Eyes" conjures up memories of Maiden's "Wasted Years". Carlo definitely knows his way around his guitar, leaving Devil's Breath overflowing with interesting leads and flashy solos. The rhythm section is equally involved in the Essenza sound, with Alessandro's bass slapping time with Carlo's leads. Whether adding depth to Carlo's riffs or flashing a bit of bottom-end groove, such as on "Fighting The Wind", the bass is an ever-present and welcome layer. Paolo throws out some nice double-kick to start off the thrashy "(Universe) In A Box" and adds plenty of crash to the already-mentioned album highlight "Edge of Collapsed World". Vocally, Carlo does a decent job delivering the lyrics in his distinctive sneering, nasal style. While he reminds me a bit of Dave Mustaine's early days, his voice isn't nearly as polished or steady. "Dance of Liars", a song conforming to traditional European power metal standards, finds Carlo stumbling a bit when hitting sustained high notes. He struggles the most, however, with the cheesy lyrics of "Rock 'n' Roll Blood". The song is a decent blue-oriented hard rock track, but Carlos and the questionable lyrics team up to submarine the mood. Thankfully this low point is followed up by a nice atmospheric guitar tone on "Fighting The Wind", and Essenza regains momentum to close out Devil's Breath in strong fashion with the classic rock highlight "Flying Acrobats". Devil's Breath is a solid transitional album as Essenza moves from their earlier AOR sound to a heavier, traditionally-inspired heavy metal style. While a few modern metal touches can be heard here and there, Devil's Breath will appeal to fans looking to keep an eye on a band headed for old-school metal success.